This gives 144 DPS, and 1191 m/s speed, both cold. It's slightly faster than the Rifter, mainly because the Rifter has an armor resistance rig and the Incursus has its speed enhanced with a polycarbon rig. Otherwise, the Rifter is a naturally faster hull, but not by much. And therein lies the problem with the slot layout. The extra low slot on the Incursus means I can partially plug resistance holes with a nano plating, and instead devote the rig slot to improving my speed. The Rifter has no such option, and must devote rig slots towards improving resistances. 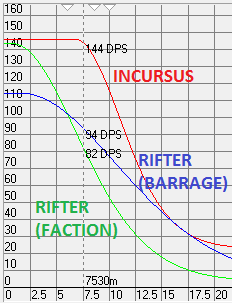 At 7.5km, the Incursus smokes the Rifter in terms of DPS, and it has a better tank thanks to its armor rep bonus. Hello loss-mail for the Rifter. On the other hand, if the Rifter is able to start the fight at brawling range, it has a great chance of winning the fight due to its neutralizer and its ability to match the speed of the Incursus. This capability is nothing new though, and the Slasher is still flat out better at executing this. 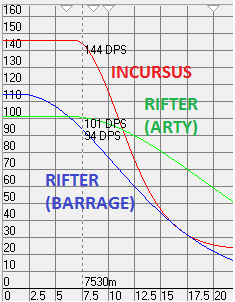 It turns out that DPS for both artillery and autocannons is roughly identical at the edge of scram range! The key advantage of artillery is that it can hit out to the edge of point range, giving it a fighting chance against long-range MWD kiting ships, and allowing it to kite outside of overheated web range. The rail Incursus also has this capability, and it actually beats the arty Rifter fit at point range in DPS if it switches to iridium ammo. The advantage STILL lies with the Incursus. My current favorite point+web kiting fit is currently the Atron, which I wrote about in an earlier blog post. 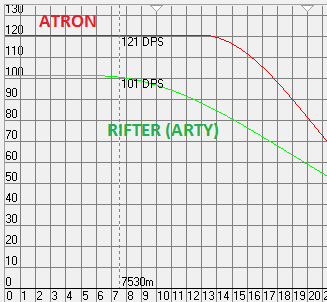 Below is a comparison between the Atron and the Artillery Rifter fit. Considering that the Atron's speed is 1382 m/s and the Rifter's is 1259 m/s, and that both ships have the same signature radius, and I'll stick with the Atron. My conclusion: I'd rather be flying a rail Atron or a rail Incursus than any Rifter fit. However, I would probably now favor the AC Rifter over blaster ships, simply because it now has the option of scram-kiting certain ships that it can't outbrawl (even if it isn't very good at scram-kiting, it has better projection than blasters with null ammo). The Rifter is also still a useful fleet tackler thanks to its small signature radius. In terms of the rankings I did earlier this month, I would now rank the Rifter as slightly better than the Merlin. This is a mild buff, but that's about it.